Party leaders are in no mood to highlight the ideological divide in the caucus. Democrats are finally in charge of the House. But they’re likely to skip one of their most fundamental responsibilities: passing a budget. Eager to steer clear of another public intraparty battle, House Democrats are expected to avoid a vote on a budget this year, multiple Democratic lawmakers and aides tell POLITICO. House Democrats are still drafting a budget, which would offer their first chance as a new majority to formally outline their broader agenda. But the resolution — which is purely a political messaging document and is not signed into law — would also stoke major ideological clashes within the caucus over “Medicare for All,” the “Green New Deal” and defense spending. “We’re still proceeding as if we’re going to do one, but we’re also considering other options because we don’t know if we can get 218 votes for anything,” House Budget Chairman John Yarmuth (D-Ky.) said in an interview Monday. Indeed, in a worst-case scenario for Speaker Nancy Pelosi and her party, the budget could be an embarrassing flop on the House floor. Most Democrats say publicly they want a chance to vote on their party’s fiscal blueprint after eight years of rejecting GOP budgets. Privately, however, lawmakers and aides say that a budget is unlikely to come for a final vote. It’s an acknowledgment of the divisions within the caucus even on key principles, and a sign of how difficult it will be to craft actual legislation in the months to come. 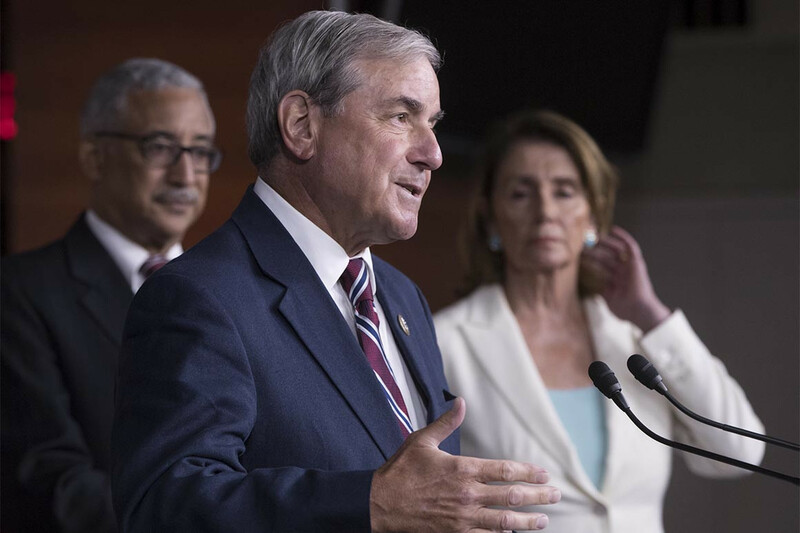 Democratic leaders have made no formal decision, though Yarmuth met Monday with Pelosi and other top Democratic leaders, including House Appropriations Chairwoman Nita Lowey (D-N.Y.), as they discussed skipping a floor vote. That meeting comes after Yarmuth has spent weeks huddling with dozens of committee and caucus leaders as he strives to bring it to the floor despite the daunting odds. Several senior Democratic aides said it makes little political sense to spend weeks perfecting a messaging document when there are other items with far greater partywide appeal on their to-do list, like an upcoming vote to address the gender pay gap. That’s particularly true, they added, after the caucus’ factions openly warred last week over how to handle Rep. Ilhan Omar’s comments criticizing pro-Israel advocates. “I hope we can work through a budget process, but it will not be easy, and I get the idea that it may be impossible to arrive at consensus on that document,” said Rep. David Cicilline (D-R.I.), chairman of the Democratic Policy and Communications Committee. Yarmuth said his budget won’t include some of the most iconic ideas championed by progressives, like Medicare for All or the Green New Deal, which have been panned by moderates. House Democrats still plan to release their budget draft this month, which will be their counteroffer to the newly unveiled White House budget. Unlike spending bills to fund the government, Congress doesn’t need to pass a budget on the floor. The House and Senate rarely find agreement during divided government. With a tricky electoral map for Republicans in 2020, Senate Majority Leader Mitch McConnell is unlikely to put his members through a budget vote on the floor, though his budget chairman, Mike Enzi (R-Wyo. ), has said he plans to draft one. But failing to pass a budget would be an embarrassment for Democratic leaders, who hammered Republicans when they were in power for consistently struggling to unite over a party blueprint — and failing to put one on the floor at all last year. House Republicans skipped a floor vote amid an ugly intraparty fight over how deeply to cut assistance programs for the poor. It also wouldn’t be the first time Pelosi punted; her previous majority skipped a budget in 2010, even when Democrats controlled both chambers. Still, Democrats had been expected to pass a budget this year after their decisive win in November, with their members eager to define their political brand and show progress to their base after two years in a GOP-controlled Washington. This year’s historic freshman class, however, heightens the challenges for Democratic budget writers. Forty-three of the party’s new members come from previously Republican-held districts, and GOP operatives are watching closely for controversial votes. Even with the rise of progressive lawmakers like high-profile freshman Reps. Alexandria Ocasio-Cortez of New York and Rashida Tlaib of Michigan, there are more Democrats in the centrist Blue Dog and New Democrat coalitions than in the Congressional Progressive Caucus. Every major caucus and committee is in talks with Yarmuth and other top Democrats to craft this year’s blueprint. And every corner of the caucus will need to back the budget, because Democrats can afford to lose few votes on the floor. Some moderates say they have little interest in squabbling over the fine print of a budget this year. Instead, they say Democrats should focus on the looming threat of another budget sequester, which would impose billions of dollars in cuts if Congress can’t reach a deal this fall. Rep. Kurt Schrader (D-Ore.), a co-chair of the Blue Dog Coalition, said his group has only occasionally voted to support Democratic budgets on the floor in the past. This year, the group has worked behind the scenes to push for a budget proposal that wouldn’t add to the deficit, along with other demands, but hasn’t committed to supporting it. “Maybe there’s an opportunity to have a paid-for budget that makes sense and we can get behind,” Schrader told reporters when asked about the budget’s prospects. A deficit-neutral proposal, however, would force Democrats to make tough sacrifices when writing the budget. The outcome could anger defense hawks who want to see massive Pentagon budgets or progressives who want bigger investments in education and anti-poverty programs. Democrats say they fear drafting a budget resolution would harden battle lines among the various factions, particularly defense hawks and doves as they’re forced to settle on a total dollar amount for the Pentagon. “Obviously, we would love to be able to have a Democratic Caucus unity budget, but it’s going to be a line to walk to get there,” Rep. Pramila Jayapal, co-chair of the Congressional Progressive Caucus, said in an interview. One of their group’s key requests involves more accountability for Pentagon spending.